Greater Grace Church (GGC), also known as Greater Grace World Outreach (GGWO), is a Christian ministry that is Bible-based and Christ-centered. We believe and practice the cardinal teachings of the historical Christian faith. Our mission is to propagate the Gospel of Jesus Christ locally, nationally, and internationally; to teach, in word and deed, those within our sphere of influence; and to practice and promote a Christian lifestyle. Established in Baltimore in 1987, GGC has been training men and women in the ministry of the Gospel ever since and reaches out to places in the city, around Maryland and around the world. Locally, Greater Grace congregations are in the Dundalk and Hampden neighborhoods of Baltimore and in the towns of Westminster, Silver Spring, and Havre de Grace. GGC Baltimore also serves as home base to a network of affiliate churches throughout the U.S. and the world. GGC is actively fulfilling the Lord’s Great Commission to go into all the world, preach the gospel and make disciples. The Greater Grace Missions Program supports hundreds of missionaries in 60 countries and over 500 churches in countries outside the United States. The primary resources for assisting these self-governing and self-sustaining congregations are The Greater Grace Missions Department, Maryland Bible College and Seminary and The Grace Hour talk radio program. MBCS offers a strong Biblical Studies curriculum with an emphasis on leadership development and church-planting skills; it features an experienced, available, and capable faculty. The Grace Hour broadcasts daily from its studios in Baltimore and reaches thousands every day over the airwaves and through the Internet. Greater Grace Church in Warsaw is a Bible-centered ministry that seeks to help individuals and families grow in the grace and the knowledge of Jesus Christ. We preach the Gospel and the whole counsel of God from a Finished Work perspective. We are a Christ-centered church that believes and practices the cardinal doctrines of the faith. Our Churches in Poland: Gdańsk, Krakow i Wrocław. 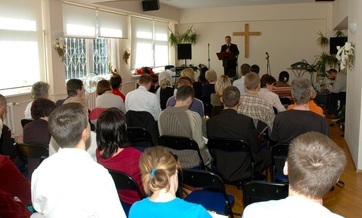 Maciej Knechciak graduated Bible and Missionary Christian Institute in Cracow. In 1997 he moved to Warsaw with his family where he began working as a missionary and assistant pastor. He has been the senior pastor since 2003. His wife is head of the Music Ministry as well as the Ladies’ Bible Study. 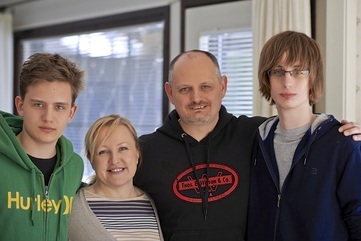 They have two sons, Dawid and Jakub.